Today’s top companies use technology to boost business and deliver enriching customer experiences. 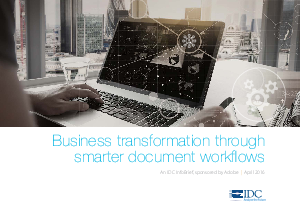 Learn how you can digitally transform your own business in this infobrief featuring IDC, a leading research company, and Adobe, the leader in digital documents. You’ll learn how to deliver rich customer experiences, speed workflows, and gain a competitive advantage.